A few fixes ago, I said that I often digitally peek at my Fix before it arrives, and often am disappointed. Then, when the box arrives, I'm pleasantly surprised. Usually, the clothes are far better in real life. It's a real rollercoaster of emotions. This fix was the opposite of that. I loved what I saw when I peeked on the website, but when I pulled the pieces out of the box, I was a bit underwhelmed. Now, how's that for an exciting introduction? THOUGHTS: In April's fix, I received a white sleeveless button-up with a racerback and tie in the front, and it was amazing. I was quite depressed that my size was out of stock. It's still out of stock, so my stylist sent me this piece instead. I see the similarity with the tie at the waist... but this top did not make me feel like I felt in the white shirt. It's a bit too prim, the quality wasn't great (it's very sheer), and I can't get past those sleeves. They really have a life of their own. THOUGHTS: I liked these pants. They fit me well, and I'm all about a wide-leg lately, but they're supposed to be cropped... On me, at 5'4", they are just awkwardly not long or short enough. I knew that I wouldn't find the time (or motivation) to get them hemmed, so back they went. THOUGHTS: Good Lord, this was rough. In the last fix, I was sent a cute off-the-shoulder yellow dress. I ultimately sent it back because it made me look pregnant. This shirt tops that, and then some. There is no side-angle photo of me in it FOR A REASON. Yikes. It was all bad. The material is very thick, too hot for spring, but also retains no shape, so it just bunched all over the place. The tie was odd, and way too long and large for the few holes it had to reach. It was oh-so itchy. There were no positives. THOUGHTS: I love poppy-print. Poppies are my favorite flower, and my poppy-print dress is my favorite piece in my closet. I was very intrigued to see that BLUE poppies were in this fix, but this piece was all kinds of underwhelming. The fit is very bad. It looks like a little girl's Easter dress, and it made my body look like a little girl's, too. The top layer is embroidered mesh and the bottom layer is very thin, and I couldn't imagine this dress making it through one wear. 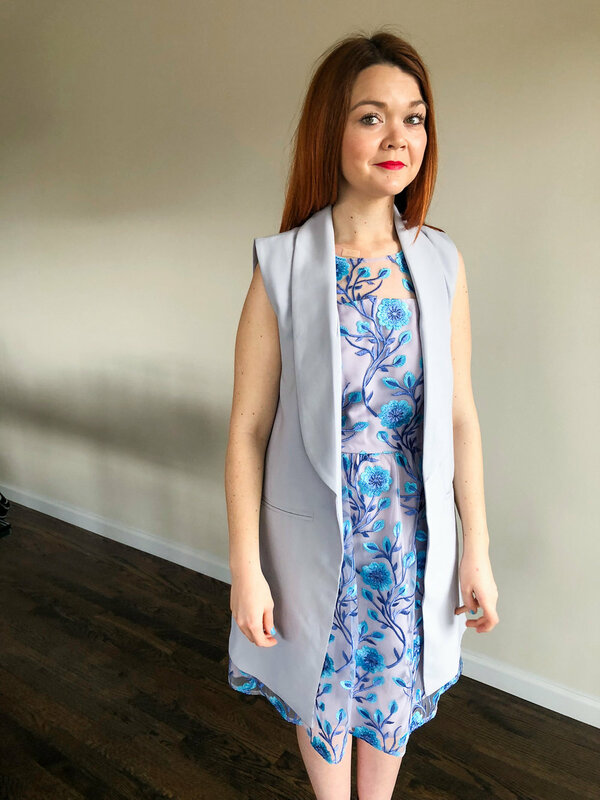 My stylist suggested pairing it with this vest from my last fix, and I did like the tonal effect.... but I couldn't imagine wearing this dress outside the house. THOUGHTS: Surprise! You've seen these mules already! I wore these in the post Third Times the Charm? and I love, love, love them! I'd looked all over for this particular color, and everywhere I looked was sold out. I'd pinned them on the Pinterest board I share with Stitch Fix, and LOW-AND-BEHOLD, they still had them! I love these mules. They have a padded insole, and because they extend up the side of the foot a bit, they're easy to walk in. They're like slippers, but appropriate to wear outside of the house. VERDICT: No surprise here, I kept these. So, what'd you think? Did you find this fix as uncomfortable as I did, or do you think I'm overreacting? I'd love to hear your thoughts, and your experiences with Stitch Fix, below! Shoot me a comment and let's chat. I'll be back on Sunday with another post, but as always, I'll be experimenting on Instagram until then! Catch Up with the Experiment! Which Glossier Product Is Right For You?